Artful, sleek, and ultra-contemporary, the Sunpan Gotham Coffee Table makes a perfect centerpiece for a modern, industrial, or urban chic space. 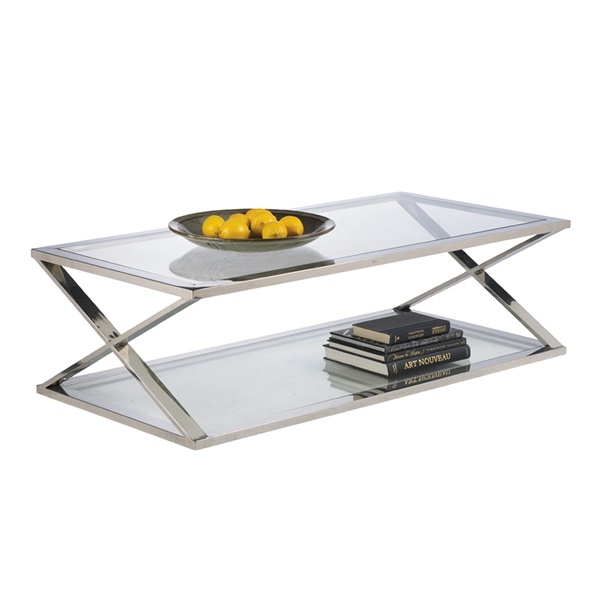 This glossy table features an X-style frame that�s durably crafted from stainless steel for a touch of metallic shine. Its top and lower shelf are crafted from sturdy glass that�s tempered for safety. The simple styling of this table makes an ideal blank canvas for displaying art or collectibles. The lower shelf also makes a handy storage space for reading material. This table is also versatile; it looks just as great in a commercial or office space as it does in a living room.